Giving people a little bit of recognition makes them love you more, and do more for you. 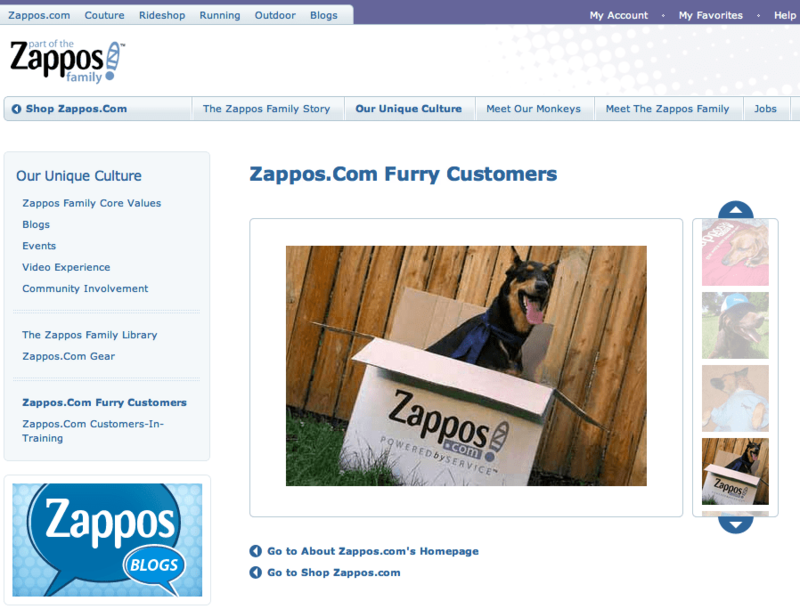 Zappos is a shoe company – so why the pictures of dogs? Pets are one of the most important things to people, so displaying them online makes customers feel important. Zappos is a master of making customers feel important. Surprising people with complimentary shipping upgrades, good customer service including real live agents, and fast no-hassle returns are wonderful features, but they are just well crafted implementations of traditional e-commerce principles. Where Zappos really excel at making customers feel important is through embracing social interaction. The Fan of the Week feature on their Facebook site allows visitors to vote for the image that will be displayed on the Facebook page that week, chosen from people who post pictures of themselves with a Zappos box to their wall. Customers submit photos that serve Zappos’ advertising needs at least as much as they serve the individuals’ desire to feel important. Zappos also solicits images of pets or babies for their site – with one condition: the animal or child has to be sitting in a Zappos-branded box. People who you make feel important will do more for you, because they see you as someone who affirms their importance. Yes, that is a circular statement. It’s also a very powerful yet insidious way of getting what you want. Give something away free to customers “because you are so important to us.” This could be a month’s free membership, free shipping, or any number of other low-cost (to you) items that still serve as a pleasant surprise to customers. Have an exclusive thing that only certain individuals get. Each “certain individual” need not know how many other “certain individuals” there are. It can be something mutually beneficial like an early-warning e-mail list that is only open to repeat customers, letting them know about deals before they are generally announced. Make it clear that your customers are important by giving them a place on your site. It need only be the capacity to comment on blog postings, but why not get more creative and choose “featured customers” or ask for customer submissions?